1918: WWI General John Pershing’s recorded voice was first heard in a speech he made from France on April 4, 1918. Since radio stations had yet to exist, Pershing’s patriotic message was distributed as a phonograph record. The speech was meant to rally American support for the growing tide of U.S. soldiers fighting the Germans on the Western Front of Europe. Click on the player below to hear Pershing’s speech. 1932: Few people know WWI General John J. Pershing won the 1932 Pulitzer Prize for history for his two-volume book set “My Experiences in the War.” When Pershing came to accept the honor in New York City he made light-hearted mention of his fear of public speaking. Pershing also mentioned another Pulitzer Prize winner and American writer by the name of Willa Cather. Cather had been a former student of Pershing’s decades earlier at the University of Nebraska. Click on the player below to hear Pershing’s speech. 1936: Five years before America entered WWII against Germany, former WWI General John J. Pershing warned of the rising threat Naziism in Germany posed to the rest of the free world. 1937: At the age of 76, John Pershing dedicated the Montfaucon American Monument in France. 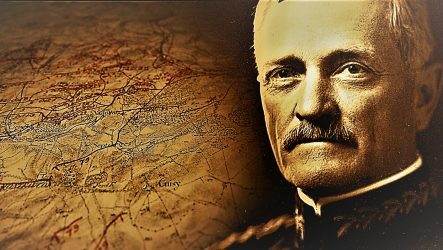 Two decades earlier, Pershing commanded more than a million U.S. troops who fought in the deciding WWI battle of the Meuse-Argonne which surrounds the area where the memorial monument stands today. More than 14,000 U.S. soldiers who died fighting in the Meuse-Argonne battle are buried here. Click on the player below to hear Pershing’s speech.